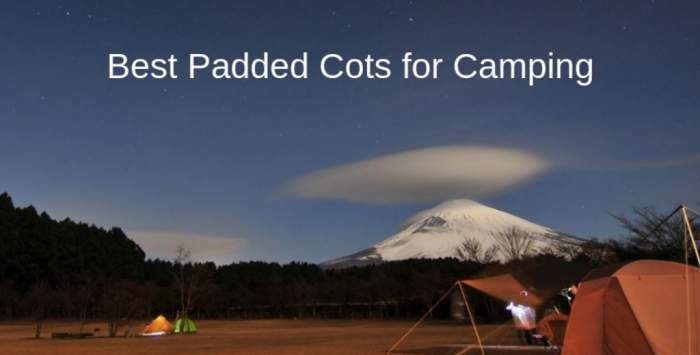 Here you have my list with 9 Best Padded Cots for Camping that are on the market in 2019, folding and collapsible types, all models from renown brands. So please keep reading. The main differences between the two groups is their packed size. So those with folding design remain relatively large in two dimensions when packed. This is because you fold them from two sides like a book. On the other hand, the collapsible padded cots when packed remain relatively large in one dimension only. From these differences you realize also that the first group does not require any particular assembly, you simply unfold them in a simple move. Collapsible cots, on the other hand, need a simple assembly, without any tools of course. This Amenities Depot cot is one of the largest on the market so I have included it in my list of extra long cots and also of extra wide cots. Its bed measures 85.6 x 39 inches (217 x 99 cm). But obviously, it is here in the list because of its thick padding. So what you have here is a high-quality memory foam. With such a padding you will never need a mattress. Yet another great feature here is that its legs are extendable. This means that you can make the bed perfectly leveled even if you use this cot on a terrain which is not flat. This is a very frequent situation when you go camping. The cot is a folding type and this means very easy to use and to take away. It may look heavy, it weighs 22.7 lb (10.3 kg), but when you compare it with the other cots of this type, you realize this is a normal weight. 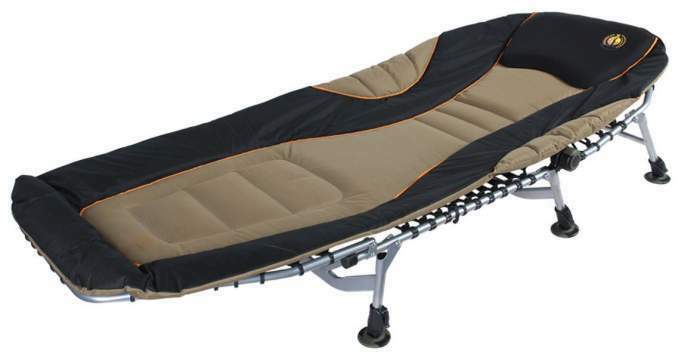 Bushtec Adventure Camping Cot Sierra 440. This Sierra 440 is one of those padded camp cots that fold from the two ends and the result is around 1/3 of its size. Though it becomes rather thin so you can store it in narrow spaces. There are several great features here. First, to mention that this is a very wide and long cot, the dimensions are 82 x 34 inches (208 x 86 cm). This is why I have included it in my list of extra wide cots. So if you are a tall person, this is the cot for you. The number 440 in the name indicates its great capacity in pounds, so this cot may easily support heavy people up to 200 kg. It is fully padded as you realize from the picture. You also have an adjustable head incline so you can use it as a lounger. The legs are also fully adjustable and if you use it on uneven ground, you can still make it completely horizontal. Please follow the link to my full review. 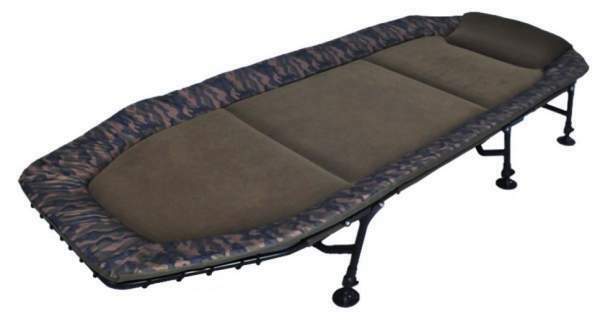 Chinook Heavy Duty Padded Cot. This Chinook Cot is also one of the extra wide cots with its dimensions 80 x 33 inches (203 x 84 cm). The picture indicates yet another of its great features and this is the adjustable head incline, so you can keep this part at several different positions. Also adjustable are its telescopic legs, and they come with those pivoting feet, so here again you have a design which will adapt easily to any surface. This is one of the padded folding cots so its packed size is 34 x 30.5 x 10 inches (86 x 77 x 25 cm), similar to the Sierra Cot above. The frame is aluminum and this is a welded construction. 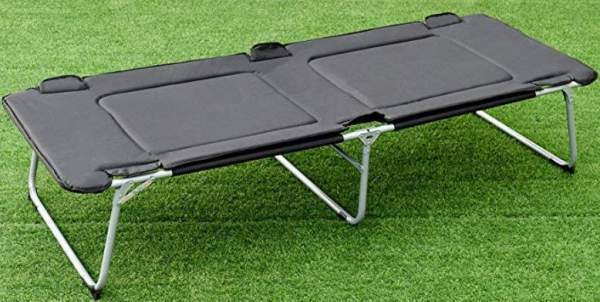 This Goplus Foldable Camping Bed is a folding type and it folds only once so the packed size is quite large. But this is also a very long and padded cot, easy to use and to fold away. The deck covers the metal perimeter frame and you have padding everywhere. If you want to see some numbers, the size is (L x W x H) 84 x 30 x 16 inches (213 x 76 x 41 cm), and the weight is 22 lb (10 kg). As you realize from the picture, it has three bars instead of standard legs, so the weight is distributed and the cot will not sink much regardless of where you use it. Here you have something different. 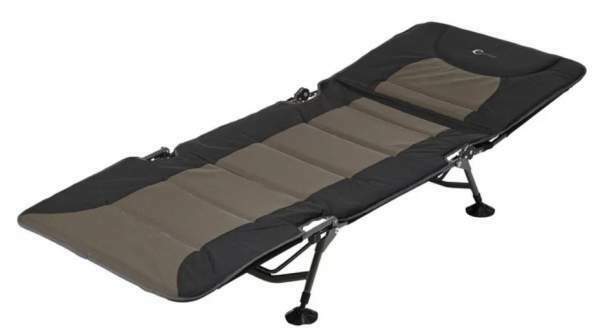 This Gecko Camping Cot is a military-style stretcher. The meaning of this is that this is a collapsible type (you remember the types mentioned above). So when packed, this cot can be carried in its nicely designed carry bag which is 40 x 8 x 6 inches (102 x 20 x 15 cm). Being a collapsible type means that it needs assembly. But this implies only that you unfold it and spread and then attach the two end bars. All other pieces are pre-attached. So the setup is easy and you need no tools for this. The padding here is not so generous as in the folding cots that are here in the list. But it still gives some cushion and insulation so you do not need a pad in at least 2-season use. The bed size is smaller, 74 x 30 inches (188 x 76 cm), so bear this in mind if you are a tall person. But the capacity is good, 330 lb (150 kg). Note that they show confidence in their product and offer a 5-year warranty. OzTent King Goanna Camping Cot. This cot may look very similar to the OzTent Gecko cot above, but this King Goanna is a much larger cot. So this is again a collapsible design and when you pack it, it fits in its nicely designed carry bag shown in the picture. But this is a huge cot with the dimensions of 82.7 x 31.5 inches (210 x 80 cm), so naturally, I have included it in my list of extra long cots. This cot has been on the market for a number of years already, all is known about it and there can be no unpleasant surprises. Note that they give a 5-year warranty which I find quite remarkable. Please follow the link for more. Timber Ridge Camping Cot XL. This Timber Ridge XL Cot is what the letters XL indicate, the bed size is 81 x 29 inches (206 x 74 cm). So if you are a tall person, this is a camping cot you need. Obviously, this is a padded camping cot and this is why it is on the list here, and this is also one of the folding cots. It comes with some bonuses and those include a bottle holder on the side, plus storage pouches. This is nice to have to keep your small items off the ground. Note that you have a generous padding at the head side so you might manage even without a pillow. The backrest is adjustable and reclining, and the same holds for its legs. You have knobs on the sides which you use to adjust the backrest incline. This is a steel and strong structure. Timber Ridge Juniper Camping Cot. This is yet another padded cot here from the Timber Ridge brand. But this Juniper is different from their XL Cot given above in the list because of only 4 legs which you have here. This may be an advantage if you use it in spaces with a small floor area. You can still set this cot up so that its deck hangs above some low items around. The frame is again steel and the bed size is 79.2 x 29.9 inches (201 x 76 cm), so it is a bit shorter than their XL cot, but it is a bit wider. Here again you have a reclining design with adjustable backrest, and all four legs are also fully adjustable. Please check the link below for more details. Westfield Outdoor Quick-Set adjustable camp cot. This Westfield cot is similar to the Juniper cot above, so you have four legs only. It is padded of course and this is why it is in the list here. The cot is with the reclining design, so the head section can be angled as you want. This makes it versatile because you can use it as a chair or as a lounger. This is a long cot, the dimensions are 78.7 x 29.5 inches (200 x 75 cm). With such a padding, you can use it as an emergency bed at home and for sudden guests, or as a camping cot. You will not need any extra pad underneath you for summer or 2-season camping. Please follow the link for more. 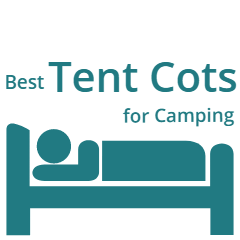 To conclude this list with Best Padded Cots for Camping by stressing that it will be updated regularly, so bookmark this text and visit it from time to time. I shall keep adding more cots of this type as I find something really interesting on the market. If you need something different, just look around, there are hundreds of cots described in detail in this site. If the padding which you have here is not thick enough for you, perhaps you might want to check my list of cots with mattresses. Yet another option could be tent-cots with padding. 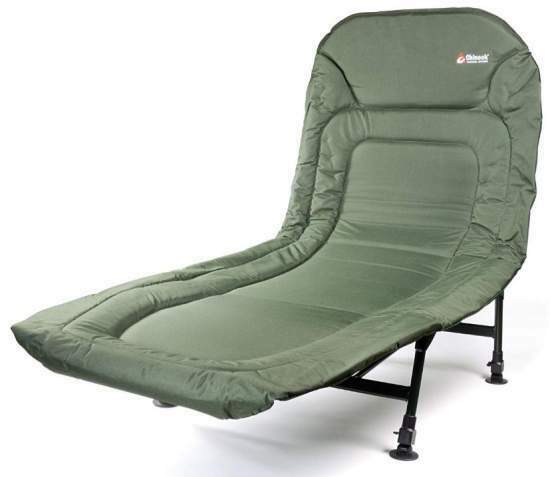 So you have this Ozark Trail tent cot and also the double-size variant. Please let me know if I have missed mentioning some items that are worth including here, I shall be glad to check and to include them in the list. 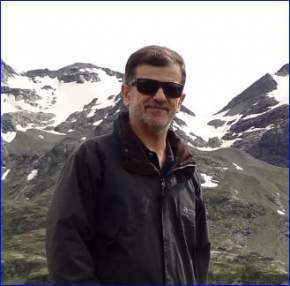 There is a comment box below so do not hesitate to contact me in the case of questions or comments. I wish you a nice day.